Time to pop Mr. Sloto’s newest slot until the wins fall out! 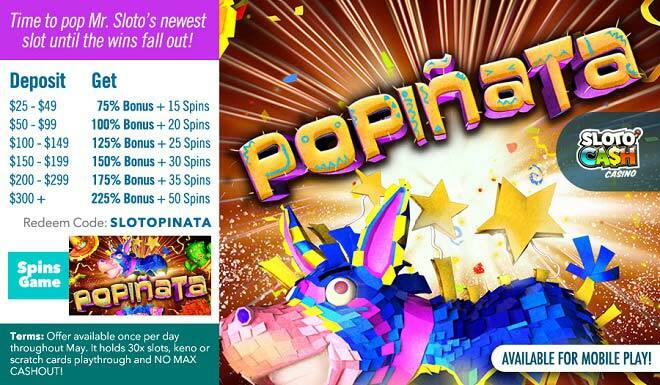 This May, Mr. Sloto would like for you to be the first to do the honor of hitting the reels of this latest slot 'Popiñata' and play it with up to a 225% Match + 50 Free Spins! Dash for prizes when you spin the reels of 'Popiñata' where you'll be feeling like a kid in a candy store with images like tacos, a sombrero, a donkey piñata, beer, jalapeños and claim wins with help from free spins, multipliers bonus rounds and more! Fireworks will occur this May when you spin Popiñata with Mr. Sloto's 225% Match and 50 Free Spins! Offer available once per day throughout May. It holds 30x slots, keno or scratch cards playthrough and NO MAX CASHOUT!